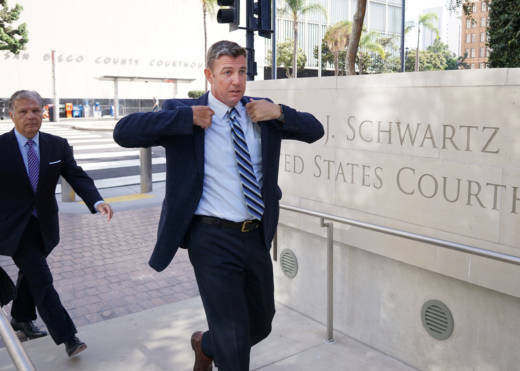 SAN DIEGO — Republican U.S. Rep. Duncan Hunter of California will likely go to trial on corruption charges after Election Day, with all sides agreeing Tuesday to allow more time to review the prosecution's evidence. The Speedy Trial Act generally requires a defendant to go to trial within 70 days of an indictment, which would have been Nov. 1 in Hunter's case. But all sides agreed to extend the time frame, which is commonly done in complex or major cases because the defense typically needs more time to prepare. No date was set for the trial, but it could begin in late November or later. Protesters outside the courthouse greeted Hunter with chants such as: "Hunter has to go!" Even with the charges, Hunter is considered to have a strong chance of winning his sixth term on Nov. 6 in the heavily Republican district near San Diego, where he is up against a first-time Democratic candidate. Hunter's attorneys said in court that they were just beginning to review the evidence turned over last week by the U.S. attorney's office, and prosecutors were expected to provide more information in coming weeks. Hunter and his wife have pleaded not guilty to spending more than $250,000 in campaign funds on lavish personal expenses including trips, theater tickets, hundreds of dollars in tequila shots and groceries. They are accused of trying to conceal the spending by passing them off in federal records as donations to "wounded warriors" and other charities or for fundraising events. President Trump faced bipartisan criticism after tweeting Monday that his own Justice Department's indictments placed the GOP in jeopardy in the midterm election. Trump referred to Hunter's indictment and an unrelated indictment also unsealed last month against New York Republican Rep. Chris Collins, who dropped his bid for re-election. Hunter also has called the indictment by a grand jury a political witch hunt.